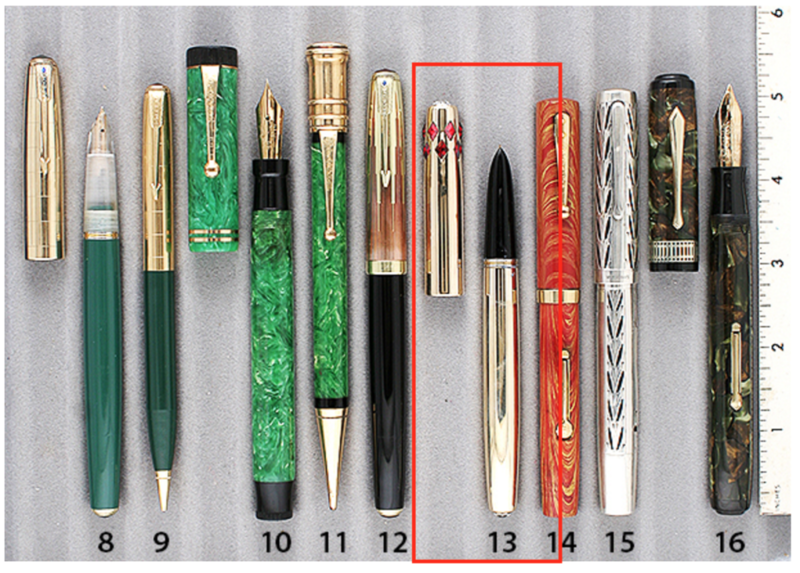 This is a 1950 Parker 51 Princess Demi Aerometric-fill in smooth gold-filled. The cap top and barrel bottom each have a large white glass crystal, and the cap is surrounded by 12 diamond shaped red glass crystals. So very rare! According to Zazove & Shepherd in their Parker 51 book (2004, p. 71), “The rarest Demi in existence…was designed by Don Doman and introduced in the mid west USA. Only a limited number were made and it never went into full production. Furthermore, it did not feature in Parker Advertisements.” Different size, shape and color jewels were used. Correct with no clip. Fitted with a Medium nib. Near mint+ (could be new-old-stock).